Are your mobile ads making the biggest impact on your company’s bottom line? This is the question UpSnap wants to help digital marketers answer. For the unfamiliar, UpSnap provides targeted, data-driven mobile advertising to attract relevant audiences for both large and small brands. In this example below, a local baker is advertising on a weather website and is able to provide the end-user with detailed information, like how close they are to the bakery based on their current location. 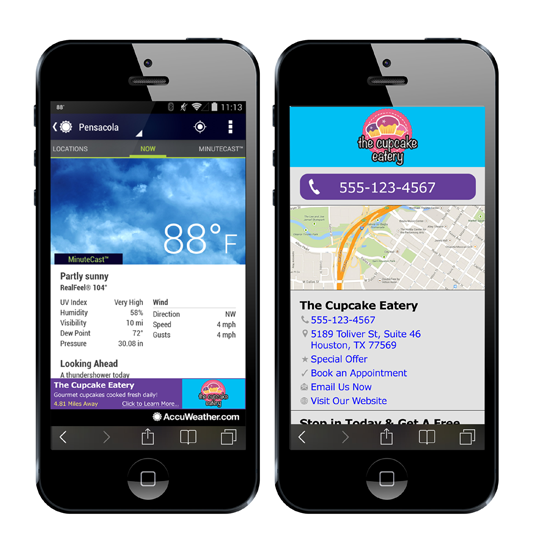 UpSnap does, however, go beyond location for mobile advertisements. This holiday season (and beyond), UpSnap advises brands that no business is too small to leverage hyper-targeted mobile advertising. According to UpSnap, local businesses are some of the ones seeing the best returns. Local merchants like dentists, attorneys and shop owners can be the sole beneficiaries of the “shop local” movement, if they know how to leverage mobile advertising to do so.